How did you find out about Boilerplate? In 1998, I returned to my hometown of Chicago for a visit. Since the city is one of the world's great centers of architecture, I took the opportunity to do some research for a project entitled Femopolis. The Prairie Avenue Book Shop on Wabash is the pre-eminent source for information on architectural and related subjects, so I made it a singular destination. While at the bookstore, I happened into a conversation with an antiquarian and told him of my particular interest in planner/architect Daniel Burnham. Burnham, along with Louis Sullivan and Frank Lloyd Wright, was one of Chicago's leading designers. His greatest achievement was the White City of the World's Columbian Exposition of 1893; it was the expo's architectural centerpiece. The White City's fountains, canals, and Beaux Arts-style buildings inspired Winsor McCay's Slumberland Palace complex as well as the Emerald City of L. Frank Baum's Oz books. When the bookstore gent made mention of a mechanical man, I thought he was referring to the 1939 New York World's Fair, where an automated mannequin named Electro was displayed as a prototype robot. But why, I later wondered, had he brought it up in connection with the 1893 fair in Chicago? To clarify matters, I combed through long-forgotten files in the Chicago Library and the Chicago Historical Society. I discovered that not only was a mechanical man on display at the Columbian Exposition, but that this "Boilerplate" (as he was nicknamed by the press) had an extraordinary career that spanned twenty-five years. Right: A movie poster, known as a half-sheet, from 1918. The film itself has been lost, along with most movies from the silent era, which is quite a shame. Click on the poster for a larger image. Below left: Detail from a Soviet poster extolling the benefits of automation, 1937. Below right: Political cartoon denouncing the threat of workers being replaced by automatons, 1894. 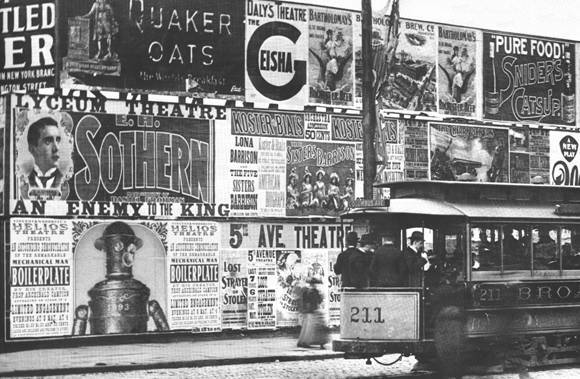 Below: An advertisement by the Helios Theatre, in New York City, for a demonstration by Archie Campion of his creation's capabilities, circa 1896. Click on the photo to see a detail of the poster. Learn about Boilerplate's inventor, Archibald Balthazar Campion. Visit the laboratory where Boilerplate was built.